Last updated 11 May 2018 . By Hannah Barnes. Alston Bar and Beef Gin Experience will make you a pro in all things juniper-based. Gin is very much the in thing these days. Whether served up infused with rhubarb, doubled in strength or masquerading as unicorn tears, new ways to experience gin are cropping up countrywide. Alston Bar & Beef is no exception; offering a relaxing yet informative masterclass in gin for six or more people. Having heard great things about the variety of gins on offer at Alston, we went along to get a taste. Hosted in the intimate 1837 Bar, just off the restaurant proper, the masterclass got off to a great start - with a G&T all round. Not just any G&T though, from the off, we were given the chance to enjoy one of Alston’s very own cold compound concoctions - small batch infusions made by the bartenders onsite. We then began to work our way through the various flavour profiles that gin offers. From citrus to fruity, herbaceous and peppery all the way to floral, the infamous history of gin was told via Alston’s chosen flavour pairings and why this spirit, in particular, has seen such a recent boom. Interesting and informative, the learning section of the masterclass was brilliantly executed, interspersed with quizzes to test our knowledge and unusual facts to keep everyone entertained. The gin itself was delicious, in particular Alston’s very own Grapefruit, Lemon and Lime cold compound, either served solo - as a tasting exercise - or with specially selected tonics and Japanese ice balls. To finish up, we were given the opportunity to try our hands behind the bar. Mixology may look complicated, but we had a great teacher, and soon got the knack. After a quick demo by our host, we each made our very own Gin Sour from scratch and sat back to enjoy. 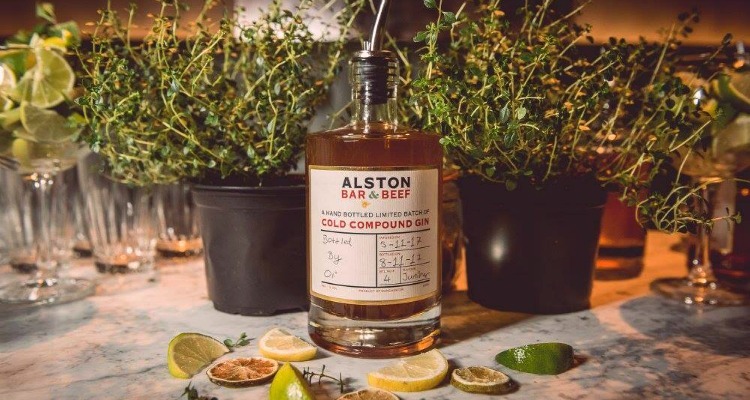 Alston Bar & Beef offer their Gin Experience for 6-12 people at £19.95 a head and dinner can be added to your evening for an extra £20 per person.